Glorious red apples! I love apples in any setting as a decor feature. They make for a fun, bright and happy theme and are reliably unisex if you don’t know what gender baby you’re having, or want to use sheet sets interchangeably between boy and girl siblings. Check out the new 2010 range of bedding and accessories at Jacob and Bonomi. Another new release includes the ‘Tree of Life’ bedding set which will freshen any room with its shades of green and pink. All linen is 100 per cent cotton, 250 thread count percale. Bedding is one thing I never compromise on for my family – we all sleep on cotton of excellent quality. There are also gorgeous new shopping bags with ice blue polka dots, plus kids’ carry-alls featuring the apple and pirate prints. 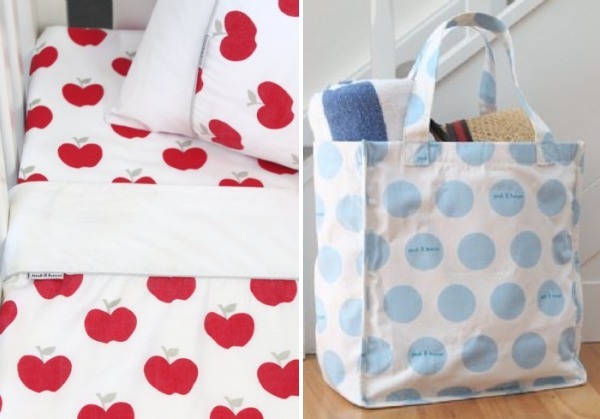 Cot sheet sets start at $49.95, quilt covers are $120, shopper bags and carry-alls are $19.95 from Jacob and Bonomi.